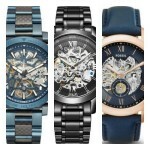 Hey everyone, today I thought we’d take a look at some of the most popular cheap skeleton watches currently available. All the timepieces features in this list are super cheap skeleton watches. It’s worth noting that cheapest often isn’t the best, but they are great for day to day watches that look nice. And if you’re on a budget then who cares right? 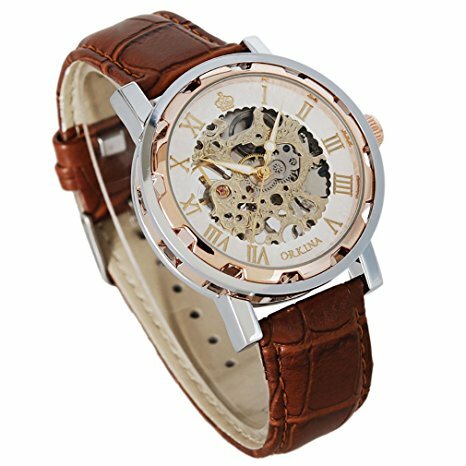 If you have a bit of a higher budget and are looking for higher quality men’s skeleton watches I’d really recommend heading to one of those articles. The different between these cheap skeleton watch and a mid range timepiece is often the movement and quality of the watch. A cheaper movement won’t have the same power reserve as a higher end skeleton watch. 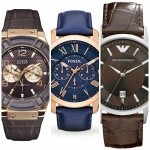 You’ll often have to wind each of the watches in this list fully each time you wear it. 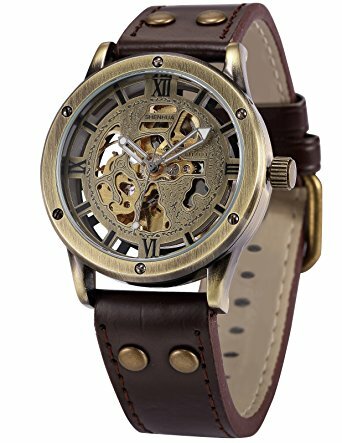 You’ll also notice most of these cheap skeleton watches have PU leather straps instead of genuine leather which is found on more expensive skeleton watches. 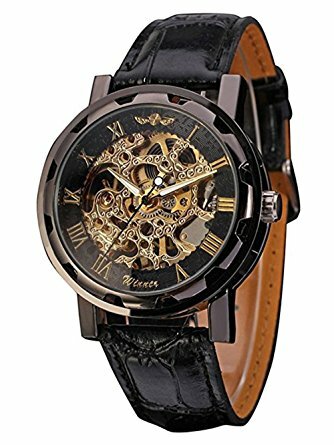 With all that being said, I hope you enjoy this list of the most popular cheap skeleton watches for men. The first timepiece we’re featuring in our list of the best cheap skeleton watches for men is this supter affordable model from Jechin. This is a mechanical hand wound watch, meaning the watch will need to be manually wound each time you want to wear it as it doesn’t have an automatic movement. As expected it comes with a basic water resistant rating that’s not suitable for swimming or showering with. As far as the style of the watch goes I do like the bezel design. 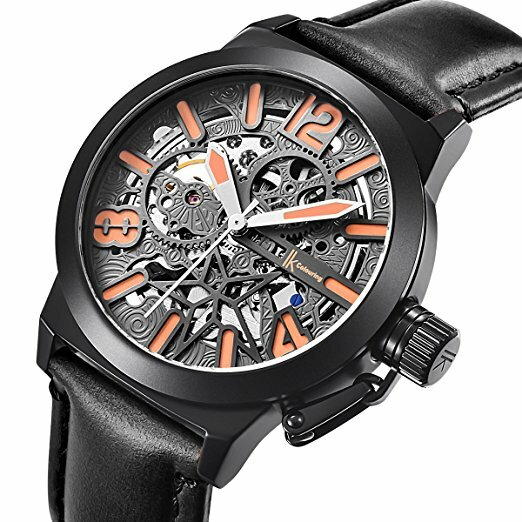 This next affordable skeleton watch features an automatic mechanical movement. Unlike the previous watch this model can actually wind it self up from the movement of your wrist. You’ll still likely need to give it a full wind up before you wear it each day. This is a vintage style skeleton watch that’s proved extremely popular lately. 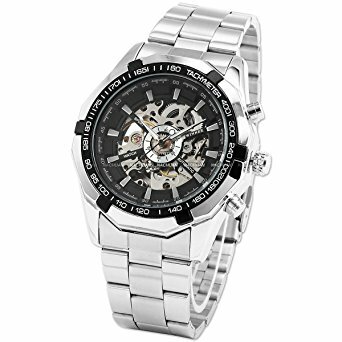 Here we have another popular super cheap automatic skeleton watch. This model is built with a Japanese automatic movement that has a self-winding feature. The dial has this skeleton display that allows you to view the movement at work. The casing and strap are both made of stainless steel. The next popular cheap automatic skeleton watch on our list is this stylish Alienwork IK timepiece. 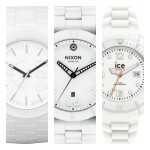 The watch features a self winding automatic mechanical movement that charges up from the movement of the wearer’s wrist. It’s a large affordable skeleton watch with a 42mm casing diameter and 15mm thickness. The dial design with the black outer ring and gold coloured mechanism does look quite nice. 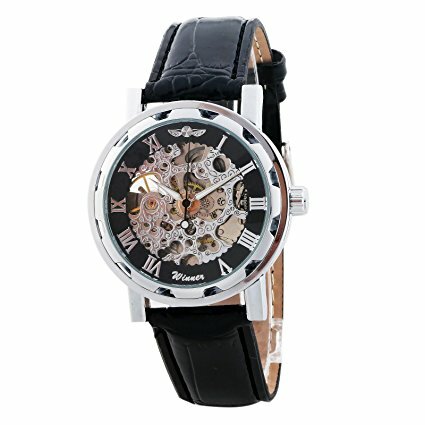 Here we have another Chinese made cheap automatic watch with a skeleton dial design. The design of this dial is quite interesting as it adds a nice element of depth. The mechanism is on show with the open gears on display. 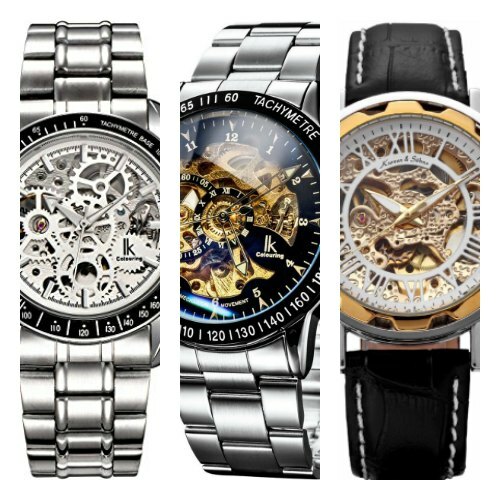 When it comes to the cheapest skeleton watches for men, it’s worth considering. Here we have another popular affordable automatic watch from Alienwork. This automatic self-winding watch charges itself up via the movement of your wrist. It’s a lightweight watch with a nice black finish and skeleton dial. 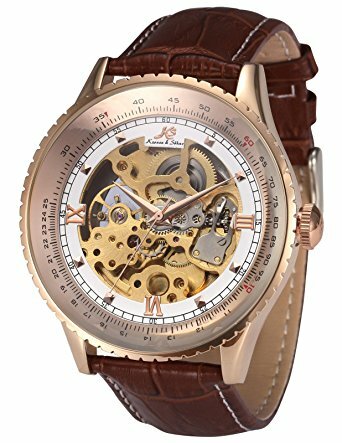 This is a cheap mechanical watch that will require hand winding every time you wear it as it doesn’t feature an automatic movement. 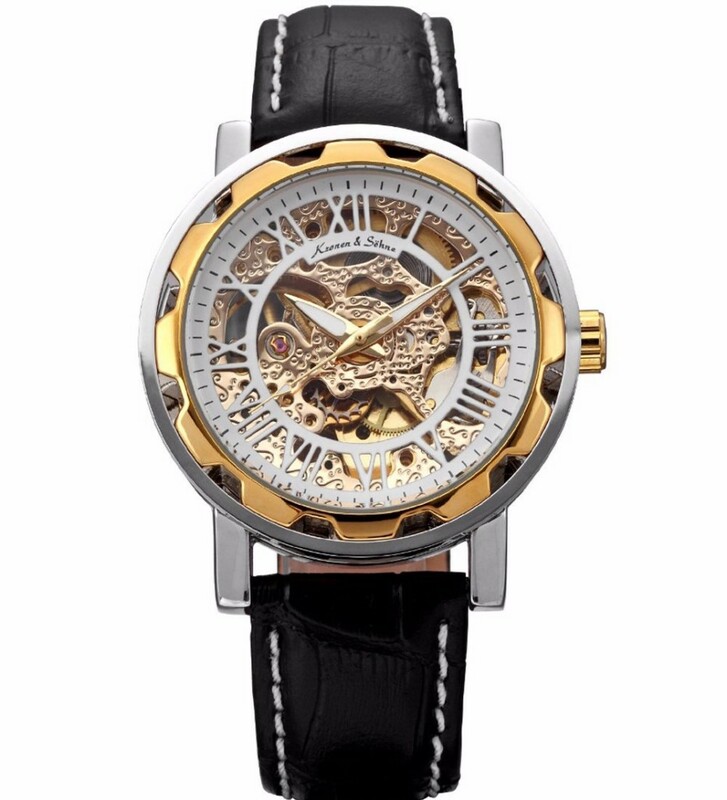 This mechanical hand-wound watch has a large 40mm casing diameter with a 10mm thickness. I do like the look of the movement when you take a peek at it through the rear exhibition style caseback. I wanted to showcase something a little different this time round so I’m showing you this cheap skeleton pocket watch. 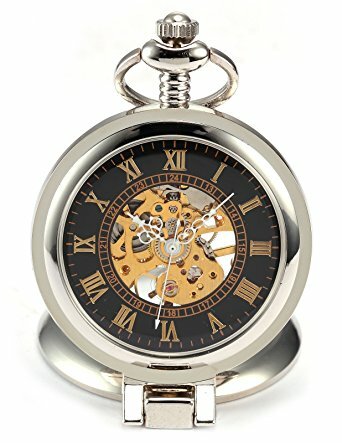 It’s a mechanical hand wound pocket watch that’s very affordable. It will require hand winding each time you want to take it out. It’s a pretty nice edition though as it looks pretty classy. 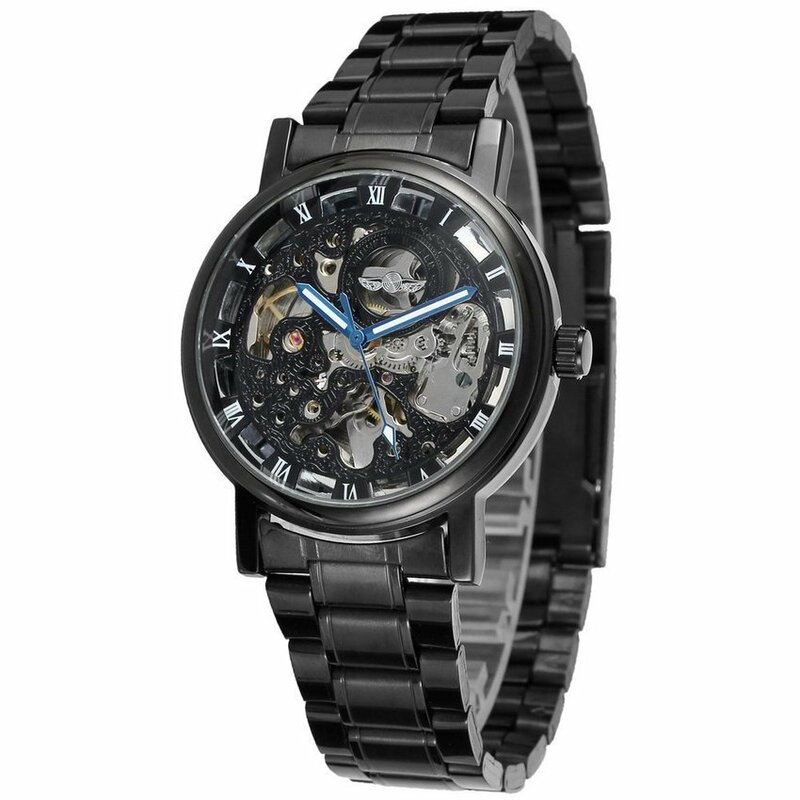 Next up on our list of the most popular cheap skeleton watches is this stylish looking Forsining automatic timepiece. This affordable automatic watch features a sleek black design with a nice dash of colour in the form of the watch hands. The watch is powered by a 17 jewel automatic movement that can be viewed through the front or rear of the watch. Here we have another popular affordable hand wound mechanical watch from GuTe. 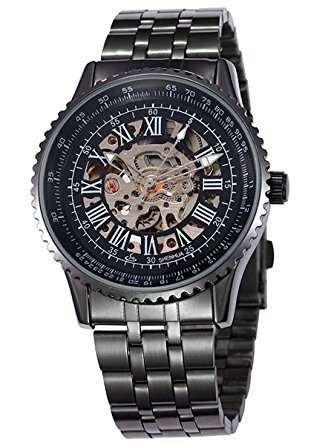 It’s a cheap streampunk watch with a skeleton dial design. This gives the watch a more expensive look than it really it. The strap is made of a PU leather that fastens with a buckle style clasp. Alienwork have another popular cheap automatic watch here. I like the bold design of this watch with its black outer bezel that contrasts well with thes rest of the dial design. This is a automatic self winding watch meaning it can charge itself up through the movement of your wrist. The casing diameter measures 42mm and has a thickness of 13mm. Here we have another popular cheap automatic watch from KS. It’s a skeleton watch with quite a glitzy show off design. This watch is powered by a self-winding automatic movement that can be seen through the skeleton dial or rear exhibition caseback. Next up on our list of the most popular cheap automatic skeleton watches is this timepiece from Alienwork. The casing is made of a ion-plated black stainless steel and is paired up with a leather strap. This is another bold design from the brand with a large amount of the automatic self-winding mechanical movement on show. Last but not least in our list of the best cheap skeleton watches for men is this open work mechnical timepiece. The watch will require hand winding each time you want to wear it as it features no automatic winding function. 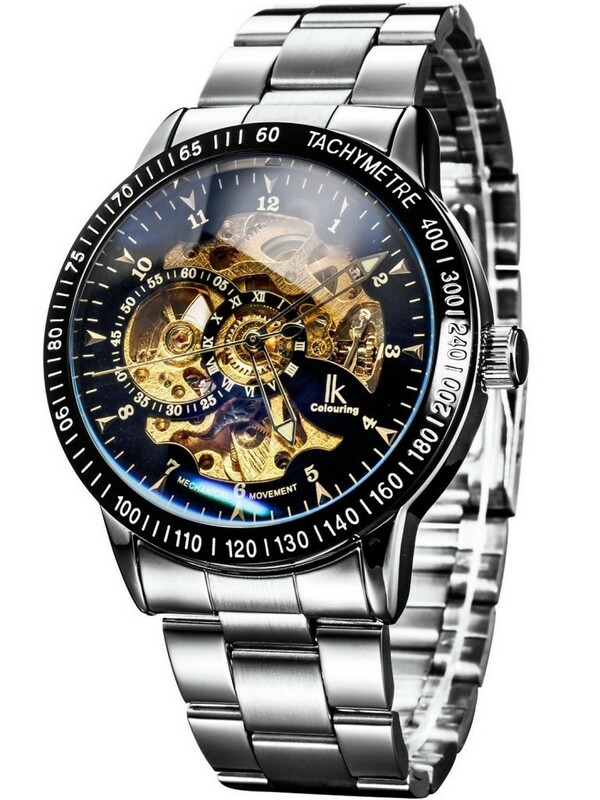 This affordable skeleton watch also showcases a large amount of the movement which looks quite nice in design. 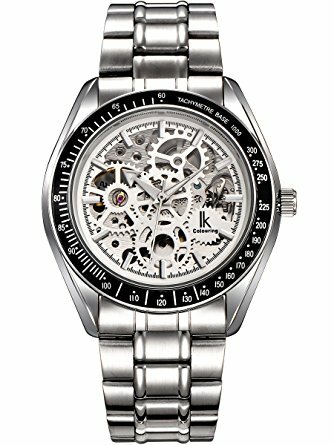 I’d like to say a massive thanks to everyone who took the time to read today’s list of the best cheap skeleton watches for men. 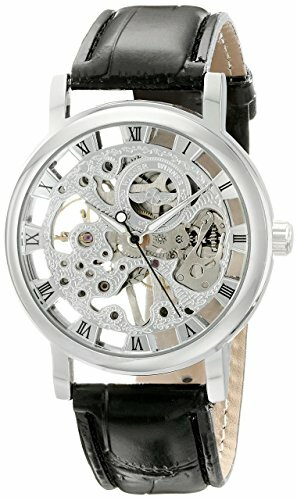 Obviously these aren’t the highest in terms of quality, if you’re looking for quality skeleton watches I recommended two very good lists earlier on. Hopefully this list has helped you find a fun day to day skeleton watch that suits you. If you need any help or have any questions just comment below and I’ll try to get back to you as soon as possible. I’m all for cheap skeleton watches but I think I’d recommend paying a bit extra, perhaps double what these cost and actually going for one of the watches from Stuhrling. I reckon you get much better value for money over the long term. Even something like the strap, these are first things to go bad on a cheap watch.